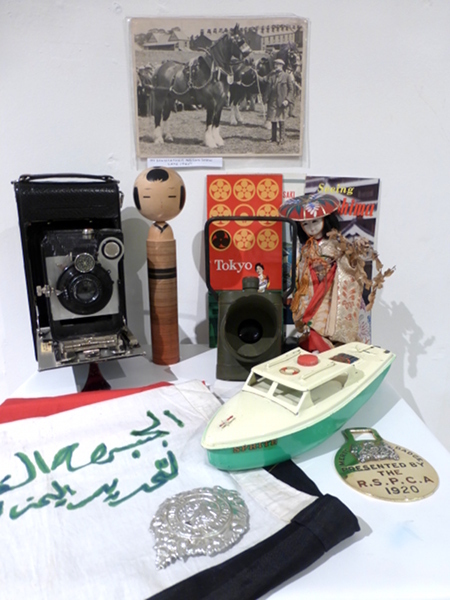 These Japanese dolls were collected when visiting Japan in 1961. We were in HMS Belfast cruiser, now on display in IWM London, and we went to Nagasaki, Hiroshima and Tokyo. One of the dolls, the tall one, is very symbolic, it was a gift and I believe it has something to do with fertility. The toy boat was made in Yorkshire. The camera: I don’t have much information about this camera, a friend gave it to me because I love cameras.